A little nugget of information - how to arrange it so that a report written using SQL Server Reporting Services will keep refreshing automatically, to display the latest data. Someone asked me on a Reporting Services course today how you could get a report to refresh automatically every few seconds or minutes. The answer is so refreshingly simple I thought I'd share it! However, the data changes all the time, and you want the report to refresh continuously. 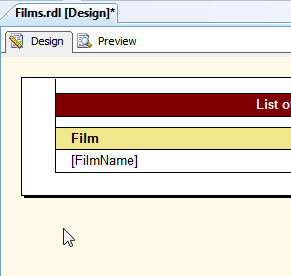 You could do this in a web page by setting a metatag, but how to do it in SSRS? Click outside any report to select it, then choose to show its Properties pane (one of many ways to do this is to press F4). Type in the number of seconds which should elapse before the report reloads. 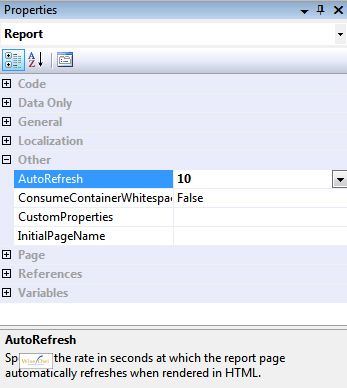 When you preview or deploy this report, it will now reload every 10 seconds! This is as good a way as any to make yourself unpopular with your IT department! If your report is refreshing its underlying data every 10 seconds, that's a lot of data traffic you're creating.